This bulletin board pack encourages students to realize that all words have rhythm. Find the rhythms of some of our favorite underwater creatures like lobsters, crabs, dolphins, scuba divers, sharks, little mermaids, and more! 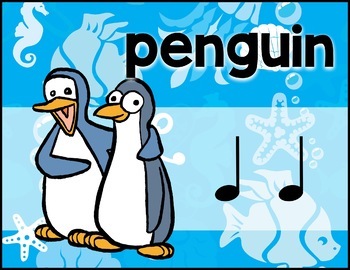 The set includes 18 Posters with ocean-themed words and pictures along with their accompanying rhythms. 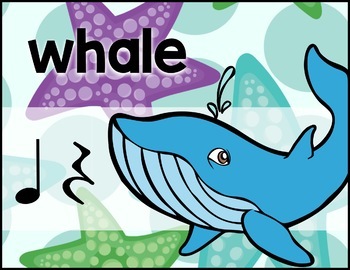 Also included are Print and Post Letters that spell out "Sounds of the Sea" with three different 4-page Whale images that can be easily pieced together to form a large poster. There's also an explanation poster that explains the connections you're encouraging between words and rhythms which is perfect for parents, administration, or any other curious viewers. 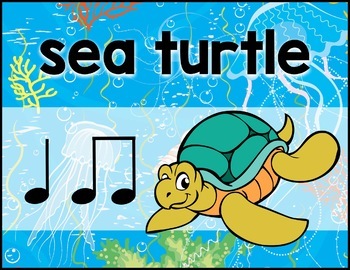 *18 different posters with ocean-themed words and pictures along with their accompanying rhythms. 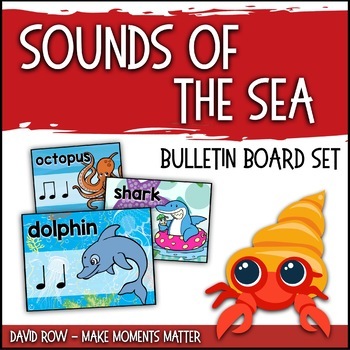 *Print and Post Letters that Spell out "Sounds of the Sea"
*An explanation poster which is perfect for parents, administration, or any other curious viewers and explains the concept of the bulletin board. *All slides can be printed in black and white but are set in multiple colors. Fish, Fish, Little Fish: Song for introducing La & Do and improvisation! These slides are intended for personal classroom use only. Buyer does not have rights to share or distribute. You may copy a slide to include in a PowerPoint (etc.) for your own classroom, but these slides may not be used in commercial products. Thank you!